In 1955 President Dwight D. Eisenhower championed a new construction project deemed “essential to the national interest.” This effort, the Interstate Highway System, is the largest public works project in American history. The enormous undertaking would come to total over 48,000 miles of roadway and cost the American taxpayers a whopping $500 billion in today’s dollars. Literally billions of that sum was spent on design service, but without those services would have made the project much more expensive if not entirely impossible to build. Most of us will never face the huge cost of this amazing accomplishment, but no matter what project you may be pursuing, you’ve probably questioned whether paying an architect to provide design services is worth the cost. Will bringing in an architect limit the amount available to spend on things that matter? Taking on a new construction project is a huge investment; like the Interstate Highway System, it may be the largest investment you’ll ever make. It is for that reason alone you want to be careful about how you spend your money. Your desire to get the biggest bang for your buck can be achieved through the deliberate planning and design of your project. Contrary to what seems obvious an experienced architect, specializing in your project type, can create both savings and value on your project that far exceeds the cost of their fee. Architects help get your ideas down on paper, flush out the design, integrate sustainable goals, resolve functional issues, and customize both the interior and exterior to meet specific objectives. Establishing project needs on paper also means accounting for code and zoning regulations early on so that your project is feasible from the very start. Making changes during the design process is much less expensive than during construction when changes are costly to implement. Work with an architect that will create a building design with affordability in mind. Efficient floor plans and cost-effective material selections are just a few of the ways architects can help reduce construction costs. Your architect should be well versed in the review of cost and performance information on different construction assemblies and materials and work with your established needs to design a building that minimizes costs while providing high performance. The most well-known task that an architect does is create drawings for a building’s design and construction. Believe it or not, drawings are another area where you can see cost-savings during construction. A thorough set of coordinated construction drawings helps a builder give you a more accurate construction cost instead of leaving it to them to make assumptions (many of which could be inaccurate). Understanding the true cost of the project before construction begins is a good way to evaluate whether to move forward or find areas where you can reduce costs. 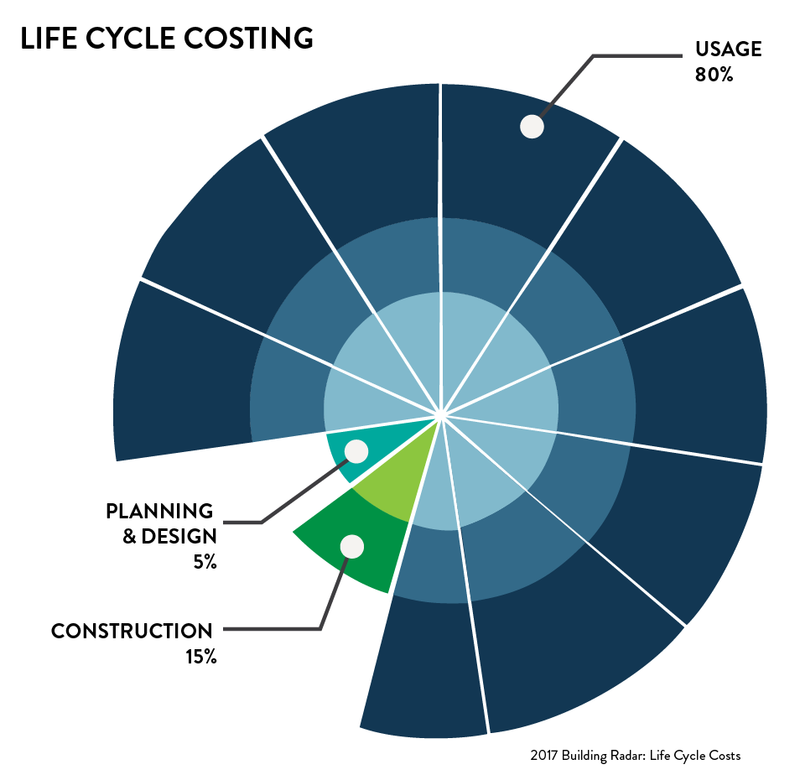 It may come as a surprise, but design and construction cost of a project actually only account for approximately 20% of the total life-cycle cost of a project. Reducing these upfront costs is good but finding ways to reduce the remaining 80% could yield the largest amount of savings for building owners in the end. Over the useful life of a building, the upfront capital cost pales in comparison to the operation and maintenance cost. By working closely with design team, you’ll be able to make educated decisions about the kinds of materials and equipment to use—things that really save money over time. Choosing efficient materials and systems will save money month after month, adding up to huge savings over time. In addition, architects perform construction observation to ensure buildings gets built to meet the drawing requirements and follow leading industry standards. Ensuring buildings are adequately insulated and meets other performance criteria helps lower long-term costs. Good design sells! A well-designed building has a higher market value, resale value, and is a better investment than standard buildings. Because a knowledgeable and talented architect will improve the functionality, efficiency, and visual appeal of the building, property values will increase. Looking back on his two terms in office, former President Eisenhower had these words to say about the Interstate Highway System, "More than any single action by the government since the end of [World War II], this one would change the face of America." And it did. Thanks to the Interstate Highway System communities all across the US are now connected - which has provided substantial economic impact to our county. It has been estimated this economic impact has returned approximately 6 times the original cost since its completion. Good design does have its price, but like the Interstate Highway Systems, it pays for itself many times over during the building’s lifetime. For 30 years, MILLER Architects has specialized in Health Facilities, completing over 500 project designs. This experience gives us the unique insight into the possibilities available for any healthcare facility, as well as allowing us to grow in non-traditional arenas, such as project financing and development. Thanks to these opportunities, we at MILLER are proud to have fully funded hundreds of millions of dollars in projects for our healthcare clients. We have also developed and now lease over a quarter of a million square feet of healthcare facilities. To learn more about MILLER Architects, please contact us with your specific project needs.